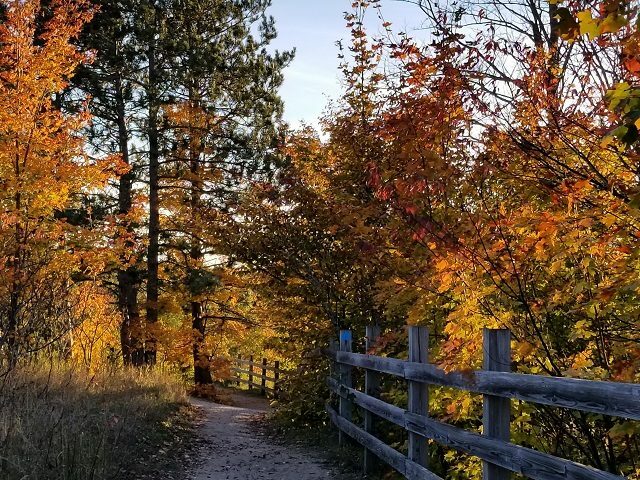 Deadman’s Hill is a beautiful vista and one of the most beloved viewing points for leaf peppers in the Lower Peninsula. It is known as a scenic spot with views of much of the Jordan River watershed, and an especially popular destination during the height of fall colors. The top of Deadman’s Hill also serves as the trailhead for the Jordan River Pathway, a 2-day backpacking trip of 18.7 miles, and Deadman’s Hill Loop, a 3.1-mile day hike. Start the loop on the pathway to your right so you are going down the steeper side. The trail to your left is better for the return, as it has a more gradual incline. This short hike has a trail that is easy to follow, scenic views and can be conquered in a pair of sturdy tennis shoes, but hiking boots are always helpful. Be prepared for some mud at the bottom of the valley.